Painting in the Midi-Pyrenees – The trails. This area around Chalebre and Lavalenet are favoured by cyclists and hikers. The number of trails available for every hiker’s taste is enormous. So far we have hiked a few that have offered unique challenges and beautiful viewpoints. Our favourite so far has been a remarkable trail near the hamlet of Nebias. This trail features a labyrinth in the woods formed by eroded limestone. This karst formation is truly labyrinthine and one needs to take care to not get lost. 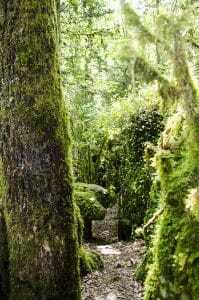 The maze is at times narrow and one squeezes between head high limestone blocks that are covered with moss ivy and small flowering plants. It is enchanting and eerie – one can easily imagine Hansel and Gretel wandering here.